Here's what several friends told me before I saw Brooklyn: "It's not my kind of movie, but it's really good and I liked it a lot." That's my take as well. 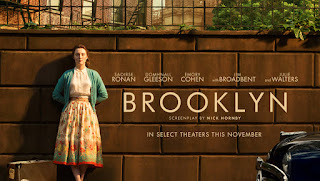 I normally gravitate toward films that inspire adjectives such as realistic, gritty, and challenging; Brooklyn is more sweet, sentimental, old-fashioned, and fairy tale-like. But I really, really liked it. The year is 1951 and Ellis Lacey (Saoirse Ronan) is about to leave her County Wexford Irish home for America. There's simply no opportunity for her in depressed post-World War II Ireland—unless she want to continue as a veritable indenture to the misanthropic and vitriolic shopkeeper Miss Kelly (Brid Brennan). Ellis isn't a willing émigré; as the youngest, she's a burden on a family reduced to an older sister, Rose (Fiona Glascott), and their widowed mother, Mary (Jane Brennan). Rose has a job, so it's off to America for Ellis, where Father Flood (Jim Broadbent) has arranged a job and lodging in a heavily Irish part of Brooklyn. Brooklyn pretty much unfolds as one would expect—a sad goodbye between Ellis and her best friend Nancy (Eileen O'Higgins), a teary dock scene before the ship departs from Cork, on-board tips from an established émigré, settling into a boarding house run by the devout and set-in-her-ways Madge Kehoe (Julie Waters), heckling from the older residents, and struggling to overcome loneliness, shed her greenhorn skin, and adapt to America. One of the things that makes Brooklyn a good film—courtesy of Nick Hornby's treatment of Colm Toibin's novel—is that all of what I've just said is communicated clearly, but in telescoped time. It is pretty much the standard (if romanticized) immigrant narrative, so why dwell on it? Director John Crowley doesn't. The story is really about Ellis' transformation from an awkward Irish lass to a confident young Irish-American woman who learns how to present herself publicly, discovers her intellect, and perfects the art of dishing out quips and snark as needed. She even transgresses her Irishness by taking up with an Italian boyfriend, Tony Fiorello (Emory Cohen), an ethnic leap that was still viewed as mildly scandalous in the 1950s. The film's dramatic crisis occurs when the Americanized Ellis makes a return visit to Ireland a year later. Things have changed in the village, or have they? The restless Ellis—who now has bookkeeping skills—finds temporary employment to occupy her spare time, and she finds herself being wooed by Jim Farrell (Domhnail Gleeson), a sweet man from the Irish upper crust. To return, or to stay; that is the question. The film's glories begin with Ms. Ronan. She is the real deal, folks—perhaps the finest young actress to emerge since Jennifer Lawrence. She's all of 21, but she's already dazzled in films such as Atonement, The Lovely Bones, The Way Back, and The Grand Budapest Hotel. She's not classically beautiful—more like irresistibly intriguing—but her enormous talent allows her to engage in a chameleon-like transformation from dowdy to desirable. When she's on screen you simply must look at her. It's hard to imagine that anyone could have played Ellis as well as she. All of the acting is strong. Waters is delicious as Madge Kehoe. Hers is a superb blend of goodness, saltiness, and prudishness. She even chews a little scenery, as when she hysterically warns her lodgers they are not to discuss "our Lord's hygiene habits." Jim Broadbent is always solid, Domhnail Gleeson strikes the right chords of being provincial yet different, and Brid Brennan ought to be the go-to gal the next time someone is casting for the Wicked Witch of the West. The performances alone make this film a treat, but credit must also go to Crowley. His past directorial work has been largely in theatre and he brings to the screen theatre's sensibility that it's okay to truncate tales and trust your audience to fill in the gaps. His light-handed direction allows the actors to infer past action emotively rather than bludgeoning us with the obvious. Call it a classic less is more approach. The film is a nice slice of the early 1950s, a reminder that Irish immigration was/is an ongoing phenomenon, and a subtle consideration of the myriad push-pull tensions between one's homeland and one's adopted land. And yes, it's sweet, sentimental, old-fashioned, and fairy tale-like. Call me an old softy, but my skeptical hackles dissolved amidst its charms. Are We Serious about Terrorism? Here’s the big test. Will President Obama pass this time, or will he once again drop the ball into the conciliatory goo that passes for statesmanship these days? The issue is terrorism—of the domestic variety. Put directly, the question is whether the United States has the stomach to tackle its homegrown death merchants. If not, it’s pretty hard to imagine it can effectively stare down the pure evil of ISIS or al-Qaeda. What makes this more acceptable than ISIS? The latest Born-in-the-USA monster is named Robert Lewis Dear, though he has a few Frankenstein-like creators behind him. Dear is the Christian jihadist who shot up a Planned Parenthood clinic in Colorado Springs and left three dead and nine wounded. Dear won’t ever see the light of day again: one of the dead was a cop, as were five of the wounded. He’s irrelevant in the larger question of what is to be done with the terror groups that are culpable: Operation Rescue, the National Rifle Association, and the extreme rightwing of the Republican Party. Operation Rescue a terrorist group? It pains me to say so, but yes. I know several earnest individuals involved in anti-choice movements. They are people of conscience willing to put their own bodies on the line, but would not harm another. They are not the problem any more than all Muslims are members of ISIS. That is why, as in the case of extraterritorial terrorism, we need to go after the heads, not the feet of terrorist groups like Operation Rescue. It belongs on the same terror watch list as other sanguinary anti-choice movements such as the Army of God and the Phineas Priesthood. 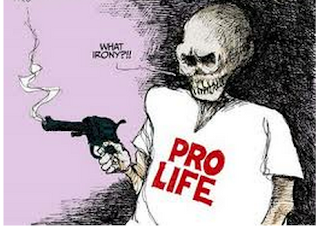 One can try as hard as one wishes to argue to the contrary, but the broader anti-choice movement meets all the criteria of a terror group: random murders (20 since 1997); intimidation (380 death and 655 anthrax threats since 2000); destruction of property (41 bombings and 173 arsons since 2000); non-lethal violence against individuals (153 convicted assaults, 100 acid attacks); and three kidnappings. Robert Lewis Dear is not indicative of a typical anti-choice activist, but neither is he a Lone Wolf. At some point all activists must be held morally culpable for the fact that their rhetoric inflames individuals such as Dear, but until that enlightened day all groups must be monitored carefully and intensively. That starts with the heinous Troy Newman, the current head of Operation Rescue. It extends also with holding GOP mad dogs such as Ted Cruz, Carly Fiorina, Chuck Grassley, and Bobby Jindall accountable for their incendiary words. They are among those who whipped up hatred for Planned Parenthood by jumping onto a “they sell baby parts” bandwagon without checking any facts, let alone the facts. What is it that Dear muttered as he was led away? “Baby parts.” Do we think he made an exhaustive study of that claim? How about a censure motion against irresponsible Republican fear mongers? And how about a STFU restraining order for the NRA? We are already witnessing backpedaling from the NRA terrorist elite. How, we are asked—for the 12,071st time this year—can we hold all gun owners responsible for the action of a lone assassin? We are asked, yet again, to imagine that Dear is mentally ill. He might be, but at what point does the Little Boy Who Cried Wolf scenario take over? Is there a tipping point in which we must say that the American species is simply too dangerous to have unfettered access to all the firepower they want? The 12,071 figure is the number of Americans killed this year by guns. If there is any solace at all, it is that Americans are also the Gang that Can’t Shoot Straight; the death toll represents just one-quarter of the total number of shooting “incidents” as of November 30, 2015. I fear ISIS, but I never feared the late “Jihadi John” as much as I fear NRA head Wayne Lapierre. Let’s face it, one of Wayne’s boys is much more likely to harm me than one of Jihadi John’s. Something needs to happen, or we may be heading for another Stonewall moment. Can you envision an Operation Rescue protest that gets routed when clinic supporters rally and beat the crap out of the protestors? I can, and I don’t want to see it happen. After Colorado Springs, President Obama pulled a page from Bernie Sanders’ campaign and announced, “Enough is enough.” It was enough decades ago. So what will it now be? Will we do something about terrorism on American shores or continue to hide behind ISIS-colored blinders? Will it be the rule of law, or the law of the jungle? Will we clean our own house, or simply demolish foreign homes?